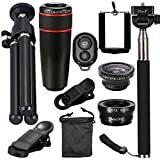 Youniker 18X Aluminum zoom telescope camera lens kit – An amazing phone lens attachment kit with 18X magnification, Works like a telescope, you can turn the objective lens to focus on any parts of the view to observe or take photos. 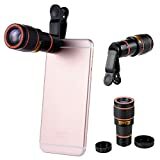 Wide usage telephoto lens for Phone: Excellent for taking pictures or videos of long distance objects, like buildings, landscapes, concerts, travel, animal observation, etc, get better pictures without buying a big camera. 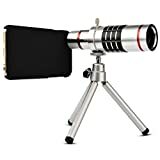 90 degrees of the scene can be captured by this unique telescope lens, which can let you enjoy the unreal world.Telephoto lens can shoot the scene within eight hundred meters very clearly applies to your phone. Mini tripod with flexible legs: All stainless steel material, the legs can smoothly extend and retract to help position your device more precisely and steadily.Additional considerate flannel pouch,Cleaning cloth and Lens cap. Dedicated phone case: Easily match with your Samsung galaxy s7,overcome the shortcoming of universal phone holder which is difficult to hold at all steady. Makes it possible for you to take photos with your phone from a longer distance. High quality optical glass for a sharper and clearer image. Can be widely used on varied occasions: watching games, listening to the concert, going traveling, distance shooting for animal lovers and journalists. 1.Remove your original phone case. 2.Insert your Samsung galaxy s7 into our dedicated phone case. 3.Screw the lens onto our dedicated phone case until the lens is securely tightened onto the case. 4.Adjust the clear focus with the naked eye. 5.Once you don’t need it, just unscrew it. 1. Line holder ring adjustment screw,loosen to slip lens holder ringer onto the lens. Please Note:The phone camera’s flash must be turned off when using the telephoto lens.